There is very little in the scientific literature about this huge faint nebula located in a direction that is well above the galactic plane. Sh 2-178 is associated with the giant molecular cloud known as the Polaris Flare. The region's overall nebulosity does not derive from hydrogen-alpha emission in the region itself but instead from dusty cirrus clouds that reflect the light of the Milky Way. The nebula is visible at both radio and infrared frequencies. It is perhaps best seen in context as the brightest portion of a huge atomic hydrogen (HI) loop (GIRL G134+34) seen in this image. The loop is also visible in infrared in this IRAS image. In both cases, Sh 2-178 is the large emission region at the right. The star in the image is the K2 III giant HD 5848, which has a Hipparcos distance of only 96 parsecs, so presumably it is a foreground star unrelated to the nebula. 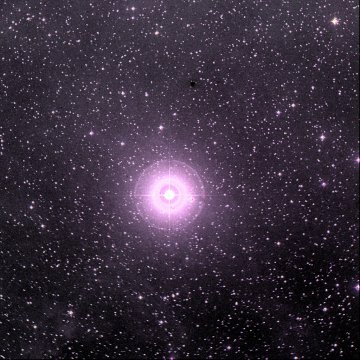 Sh 2-178 is associated with the Polaris Flare and the region's overall nebulosity does not derive from hydrogen-alpha emission but instead from the reflected light of the Milky Way. Allan Sandage first pointed out this class of high latitude reflection nebulae in 1976  and they are now sometimes called integrated flux nebulae.